Every one of us looks to save some bucks on our utility bills by limiting the consumption of electricity one way or another. Yet, most of us fail miserably in this attempt for various reasons. But there is a way to completely get around the utility bills: by making your home rely on clean and renewable energy, you can save a lot of bucks every month. We usually see wind turbines installed in vast wind farms and along the seashore. But small-scale wind turbines are also available to be employed in one’s private estate. 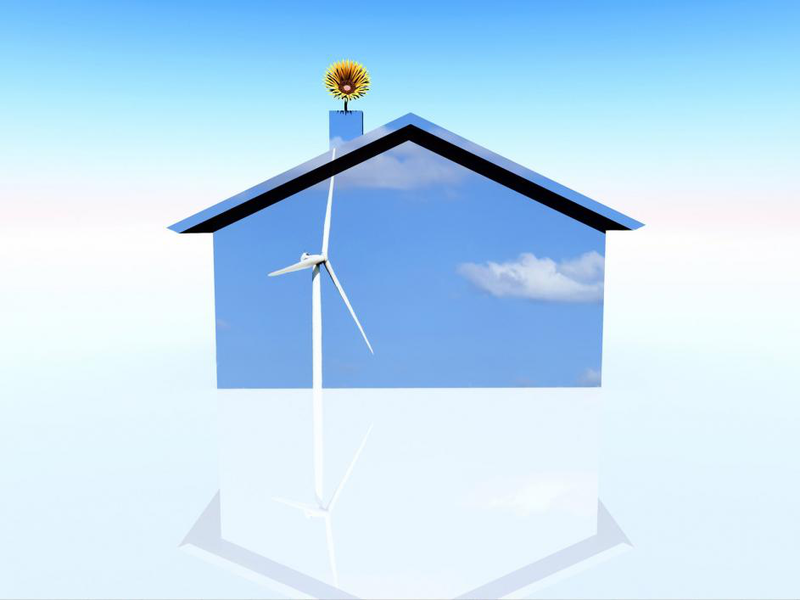 If your neighborhood is gifted with a good wind speed then a residential wind turbine can even churn surplus electricity which you can sell to the neighboring homes. With any figure of wind speed above 10 miles per hour, residential wind turbines can generate good amount of electricity. An aspect of wind turbine which gives it an edge over solar panels is that they can generate electricity during the night and even in the rainy season. However, you have to check with local rules and regulations regarding the residential wind turbines before installing one. Solar panels are the most obvious choice comes in the mind when we talk about residential renewable energy. Solar panels are not specific to rooftops. Depending on the size of the estate and house design, you can have them installed in your yard and even on walls. With best possible orientation and latitude, solar panels can generate minimum of 10 watt per square foot. If you are getting this power output from your solar panel network, then a medium-sized roof can nearly fulfill the energy needs of a household. There is a one shortcoming of solar panel, i.e., they can’t able to generate any power when the sun is down. This downside can be compensated by installing residential wind turbine in the parameters of your property. For rooftop panels, you can remodel your house with solar shingles. They are installed in place of conventional shingles. This type of solar panel is also good on aesthetics and even enhances the look of exterior façade of your house. Even if you don’t want to get completely off the grid, there are some domestic-use equipments which can help you in reducing your energy bills. Few years ago, solar ovens were only a subject of science exhibitions in schools. But now they are available commercially as well. We spend a lot of grid electricity on heating our food and this expenditure can easily be cut down by using solar energy for the purpose. Solar energy can also be used to get warm water supply which is badly needed during winters. Solar water heaters are smaller than solar panels and hence easier to install. You can also reduce your utility expenditures by saving on gas and electricity. Other than saving money, adopting renewable energy will be your contribution in saving the environment from immense footprints of greenhouse gases.